The Spectra Nomad 900B Data Collector is a powerful handheld computer used by surveyors for collecting, calculating, and saving land data in the field. With Spectra Survey Pro Standard on-board software, Bluetooth, CF slots, touchscreen and Windows OS, it allows you to collect land data by hand even in areas that are inaccessible due to poor field conditions. The Nomad 900B is equipped with a microprocessor, 512 MB internal memory for data storage and wireless capabilities for data transfer. This device is battery powered, portable, has a built-in keypad, LCD display and field software that boost efficiency and productivity in topographic surveying, mapping, and construction projects. In addition, this handheld field computer can be used as a stand-alone device or in conjunction with total stations and personal computers for viewing, analyzing and manipulating collected land data. As a mini topographic field computer or PDA, it features a high-resolution touch-screen display that shows graphics and maps in crisp detail and offers excellent visibility even in bright sunlight. It also has a backlit numeric keypad allowing for ease-of-use in dim lighting. 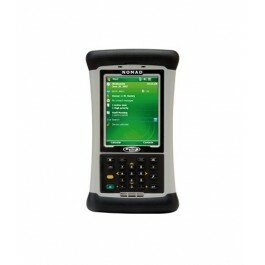 The Spectra Nomad 900B is equipped with a Windows Mobile 6.1 operating system that easily runs a variety of applications. This surveying instrument is preinstalled with mobile versions of Internet Explorer and Microsoft applications such as Word, Outlook, PowerPoint, Excel, Pocket OneNote, and Media Player. It also includes Microsoft ActiveSync, which allows for desktop control from the handheld. This powerful and full featured data collector comes standard with a high speed 806 MHz Marvell PXA320 XScale processor and 128 MB RAM for running large applications and programs smoothly. It also has built-in Bluetooth capability for transmitting field data wirelessly to a PC and for easy connectivity to other Bluetooth devices, including sensors and other field instruments. This Spectra Precision survey data collector can store anywhere from 512 MB to 2 GB of memory depending on the model you choose. It features an internal Flash storage that can retain stored information when the device is turned off or loses external power. You also have the option for integrated GPS to ensure the best possible accuracy of locations, Wi-Fi for wireless data transfer, WWAN (Wireless Wide Area Network) for staying connected to the Internet using AT&T or other mobile networks and a 5-megapixel camera for capturing high-quality images in the survey area. The Nomad 900B Data Collector comes with built-in Spectra Survey Pro Standard software. This fast and reliable on-board software gives a comprehensive set of tools to collect and organize your survey data efficiently. You can use it for data collection, calculation, mapping, data storage, data management and data transfer to your laptop or PC. Spectra Survey Pro Standard is the base model of Survey Pro software and is a complete data collection package for surveyors. It contains a complete COGO (Coordinate Geometry) suite as well as traverse, sideshot and staking routines. It has all the essential features required to properly manage a survey job and is also compatible with AutoCAD – the popular computer-aided design and drafting program used by architects and engineers. Spectra’s Survey Pro Standard software has a user friendly interface, giving complete control to manipulate survey data. With a customizable home screen, you can configure your favorite choice of field processes to optimize daily workflow. This Spectra data collector is built to withstand tough and extreme weather environments. It boasts excellent durability with its IP-68 rating, which means it has the ability to withstand sand or dust for at least 8 hours of operation and can survive immersion in up to 3.3 feet of water for 30 minutes. It even meets military standards for drops, vibration, humidity, altitude, and extreme temperatures. In fact, it can survive 26 drops from 4 feet high onto plywood-over-concrete floors! The device comes with a 5200 mAh rechargeable lithium-ion battery, providing operation for up to 15 hours. You can customize your field data collector by selecting a model and software from the drop down menu in the upper right hand corner of this page. For added versatility, the on-board data collector software is also offered in five different versions. You can pick the one that works best for you and then quickly and easily add features as you need them. You save money by getting only the software that you need for your business. As your business expands and you need more power, Survey Pro is there for you with advanced modules readily available and easy to install via electronic “unlock” codes.